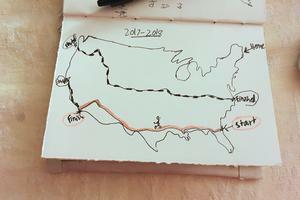 On a hand-drawn map of the United States, Cimeno shows her completed route from Oregon to Virgina and her second soon-to-be-taken trek across the southern states. Bella Cimeno, a recent George Stevens Academy graduate and Blue Hill resident, will set out on February 16 to complete a 2,800-mile trek, and she will do so supported by the community—literally. 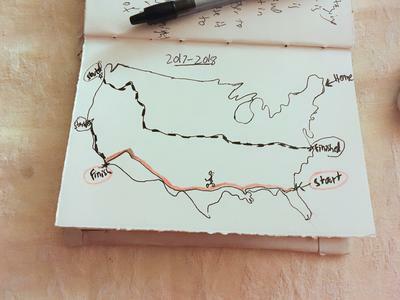 Fresh off a two-month, 4,210-mile trip from the West Coast to the East Coast along the TransAmerica Bicycle Route, Cimeno has set a new goal: this time, with a new bicycle, she will head southwest from the northern tip of Florida. Along the way she will volunteer for a week and raise funds for the nonprofit All Hands and Hearts. “The community is really carrying me,” she said, while listing the reasons a new bike will be better and easier to manage: it is more comfortable, distributes weight better, has more generalized parts and is easier to fix. Cimeno relayed a story about losing a small screw essential to move her old bike forward and how a well-intentioned stranger in Kansas drove her more than 200 miles to find the screw she needed to get back to her trip. With this new bike, she said, parts will be much easier to obtain. Cimeno has raised all the personal funds needed for her trip by working and saving the money. The 19-year-old seems more at ease giving help than she is with receiving it. Her last trip raised about $5,000 for The Maine Women’s Fund, and this time she will raise funds for those affected by last year’s hurricanes. And, not only will she raise money, but she will spend a week in Texas volunteering with an organization helping in the rebuilding effort. And, if she didn’t have enough to do, she is also planning to visit a handful of colleges—before, during and after the ride. Her next adventure, she said, will be college. 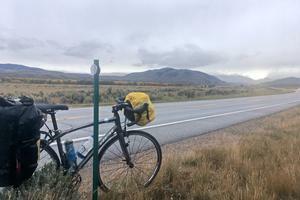 A view from the ascent up the second highest pass on her route—Togwotee pass at 9,700 feet—in Wyoming. 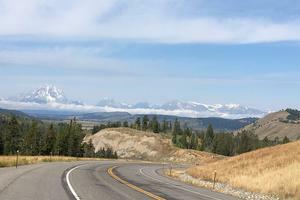 The Tetons are in the background. Cimeno pauses when the sun comes out after a rainstorm in Colorado.